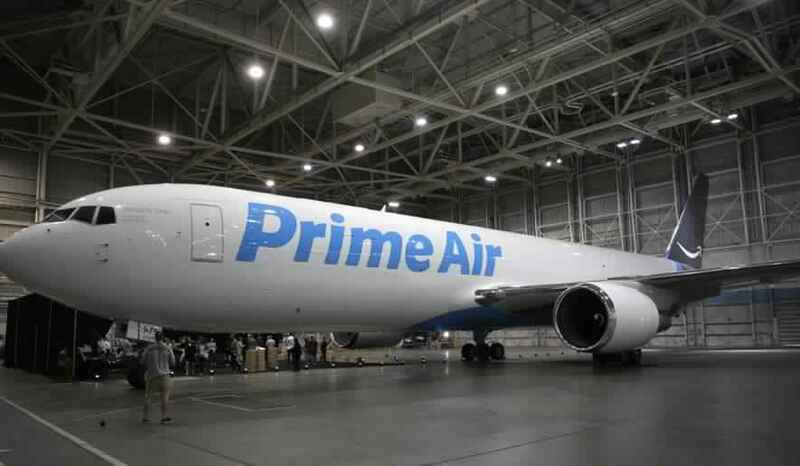 Amazon reportedly will publicly unveil its own chartered line of ‘Prime Air’ cargo jets at a Seattle air show Friday. The tech giant today unveiled the first in its fleet of branded cargo planes. Dubbed Amazon One, the Boeing 767-300 will take to the skies this weekend at the annual Seafair Air Show in Seattle. “I cannot imagine a better way to celebrate the inaugural flight than in our hometown at Seafair alongside Amazon employees and Seattle residents,” Dave Clark, Amazon’s senior vice president of worldwide operations, said in a statement. Seattleites in the area this weekend can see the branded plane — sporting Amazon’s smile logo and PrimeAir emblem — fly over Lake Washington between 1:15 and 1:40 p.m. PDT. The online retailer has been working on its “PrimeAir” drone delivery system since at least 2013, promising half-hour, same-day delivery. “Creating an air transportation network is expanding our capacity to ensure great delivery speeds for our Prime members for years to come,” Clark said. But the US has been slow to approve commercial drone regulations. It only just released final rules, more than a year after Paul Misener, Amazon’s vice president of global innovation policy and communications, complained to Congress that the FAA dragged its feet on giving Amazon permission for commercial testing. Based on an early prototype, the system is simple: Customers place an order online; the item (up to 5 pounds in weight) is then locked in a plastic container attached to a drone, which buzzes away and drops the package at your doorstep. In the meantime, the company will use Amazon One to support one- and two-day package delivery in the US. Another 39 planes will roll out over the coming years. The e-commerce giant also last month got the green light to test unmanned air deliveries in the UK as part of an effort to identify rules and regulations needed to move the drone industry forward.